One of the many benefits of wild yeast collected at home over store bought yeast (in it's many varieties) is quality and flavor control. Different flavors can come through depending on your yeast and can be controlled through various "feedings" and stages at which the yeasts are added to the dough. Sour, sweet, nutty, fruity, and mild flavored loaves have all come out of my oven. To start my culture, I created a "starter", or simply a mixture of flour and water that I left to ferment for a few days. After fermentation, a routine set of "feedings" begin, which is another mixture of two or three flours and water that help aid the sustenance of the wild yeast which have become active from fermentation. I'm sure I have lost a few people at this point, but really, it's not difficult and the entire process really happens as you do nothing and just set it to rest. As for that loaf up there, the only ingredients are flour, water, and salt. The "rise" comes from my own yeast and has a uniquely sweet and sour taste. The whole process is very satisfying, in the way that the whole process works in conjunction with nature but comes directly out of the kitchen. Here is my process, which I have culminated from many sources, and developed my own way, but is perhaps most similar to Tartine's process. Day 1: Mix an equal amount of whole wheat and bread flour with water. I do this on a kitchen scale and have it come to about 120 grams. 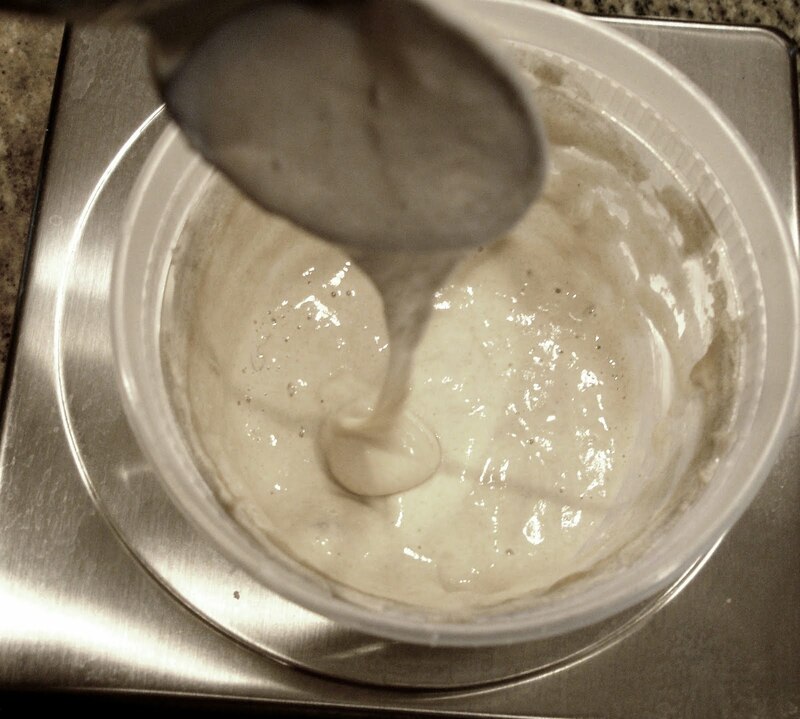 Mix it well with a wooden spoon or your hands and it should be a thin consistency but a thick batter. Keep it covered with plastic wrap and let it sit at room temperature for 3 days. Day 3: Check your flour and water mixture for any activity. If there is a pool of water sitting on top of the flour mixture, dump or scoop some off and mix the flour and water together. You want to see small bubbles forming. If none have formed, let it sit longer for a day or two more until you see bubbles or some activity. It may be starting to smell sour at this point, which is a good sign. Day 5: Bubbles should be beginning to form and it should be smelling sweeter, like very ripe fruit and sugar. At this point, the starter is active. If it is not, let it sit for a couple more days until it is. At this point, the fermented mixture contains yeasts and is ready to begin being "fed" regularly on a somewhat daily basis. To feed it, discard much of the starter (a bit more than half) and mix in equal proportion of water and flour (1/3 Whole wheat, 1/3 AP, 1/3 Bread flour) until it measures 120 g on a kitchen scale . If it is a little more or a little less it does not really matter. What does matter is that the starter begins to bubble after feeding (it may take a couple hours), which means the yeast is active and feeding. Repeat this process everyday or every other day (just make sure not to skip very long periods, and make sure to check that the yeast is active after feeding) After a week of successful feedings, the starter mixture can be used in applications for baking where you would use other types of store-bought yeast. It is as simple as that, and makes a very big difference. Preheat oven to 450 degrees. Combine flour, eggs, salt, milk, zest and 1 tbs. of melted butter. Mix all ingredients, but be careful not to overwork. Some lumps are perfectly fine. With the other tbsp. of butter, liberally grease each cup in a popover or muffin pan. Fill batter about three quarters of the way up the individual cups. Bake for about 18 minutes. Then lower the oven to 350 degrees and bake for another 20 minutes, or until the popovers are puffy and golden brown. For savory variety, include chopped herbs or spices into the batter before baking.